Highland Cattle. Cute cows, but still cows. The cow in the picture that looks like a big shaggy dog is one of four Scottish Highland yearlings that recently arrived at the Crazy Rooster Farm and Amish Telephone Booth. This one is a bull who is soon to be a steer. Even though he looks like a big shaggy dog, he’s going to be a beefy dude by next fall. 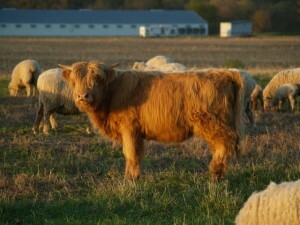 Highlanders are an easy-going breed that works well within a grass-based permaculture system because they can eat plants that other bovine breeds won’t touch. They are sometimes employed to restore woodlots. Their friendly personalities and hardiness make them easy to care for in cold climates. Their meat is favored by the Royal Family, as well as many fine chefs. And because they forage on a wider variety of plants than other beef breeds, it is believed that their meat is healthier. As you can see from the photo we are currently grazing them with the sheep. The big white building in the background is our neighbor across the road. It’s a Golden Plump broiler operation. Not quite as cute as a flock of sheep grazing with shaggy-dog cows.